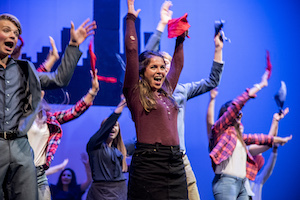 Pepperdine Student Activities at Seaver College will present Songfest 2018 at Smothers Theatre in Malibu, from Tuesday, March 13, through Saturday, March 17, at 7:30 PM, with an additional matinee performance on Saturday at 2 PM. Prior to the performances, groups are given two weeks to develop unique scripts, costumes, and scenic designs. Each group, consisting mostly of undergraduate students, will compete for the Songfest Sweepstakes Award, presented after the final performance to those with the highest score totals over the course of the performances. Shows also include student hosts, who will introduce groups and judges, lead the closing awards presentation, and guide the audience through the overall experience. Started in 1973, Songfest is one of the oldest traditions at Pepperdine University. Over several evenings each spring, groups of students perform original musical stage shows focused on a given theme. Songfest brings hundreds of students together, who build friendships and life-long memories together as they prepare, rehearse, and perform their shows. Ticket prices range between $15 and $20, and are required for attendance. For additional information about the performances, visit the Center for the Arts website.